Papercrete, a building material made of waste paper and Portland cement, is a very useful substance. Bricks made with papercrete are remarkably light in weight. Some recipes contain many other ingredients added in for various reasons.....sand, straw, silica, and others. Our work has been concentrated on paper (newspaper and magazines), and cement. Every detail of working with paper is very specific for the product (brick, cast in place p-crete, or panels) to come out right. Water volume, type of paper, mixing time, type of mixer, and more....even which newspaper you use. Also, how long the dry paper has been sitting around. The commonly seen pull-type mixer for mixing papercrete made from car differentials and tanks have their advantage, but no doubt are a hassle to use. They need to be pulled around to get a batch finished every time you mix, and you still need a barrel type mixer to do your other mixing needs like plasters and floor pours. So I think the common gas-powered 1 sack mixer (shown at the bottom of the page) is the ticket for most builders. Confucius say, why tow it ? 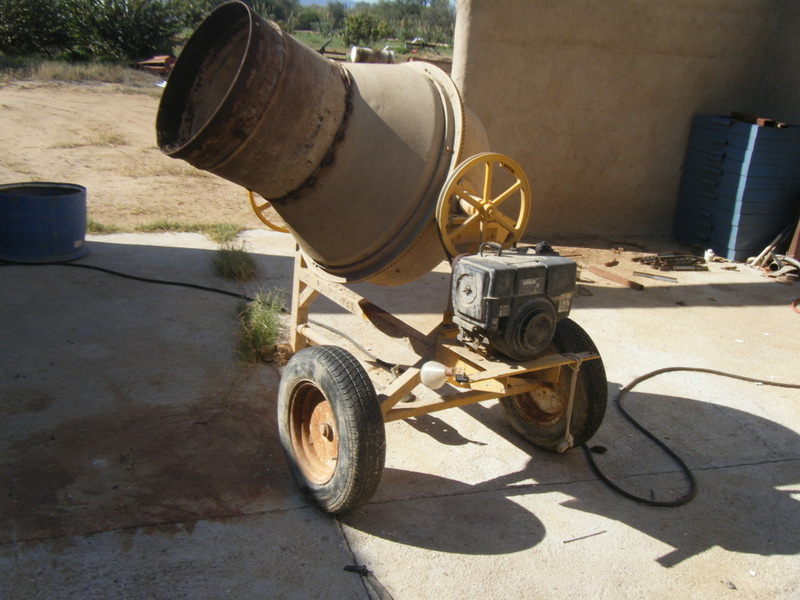 Here at our ranch, we use the same mixer we use when we mix plaster and concrete, the rotating drum type gas powered stationary model seen everywhere at building sites worldwide. For it's availability and diverse abilities in construction, it wins hands down. Add a snout made from the top half of a 55 gallon steel drum to the mouth of the mixer to get more capacity. One gallon of gas runs the mixer an 8 hour day, doing a huge amount of work with very little gasoline....1 gallon. Bolting or wiring angle iron strips with sharp spikes welded onto them on the paddles in the mixer makes for a hungry mixer-grinder machine that digests (pulps) the paper down to fibers fairly quickly, 12-15 minutes mixing time from dry whole newsprint to moldable broken down mix ready to use. Weighing the paper insures that the dosage is the same each mix. We've done 2 roofs of papercrete, the mix placed on a heavy steel gridwork ( I recommend mixing at roof level when forming roofs, to not haul all that water up a ramp like we did on the 1st roof !! ). The paper shrinks around the mesh and bonds to it nicely. For fire prevention and waterproofing, all exposed surfaces need to be covered with a fine cement/sand coating followed by cement-water paint or plaster-type coat, or elastomeric sealer. An interesting site that has much to say about papercrete is...http://www.livinginpaper.com/index.htm . Some say papercrete doesn't burn, and maybe in certain recipes this is true, but we had a small piece of papercrete ignite and it turned to ash overnight, smoking very slowly as it canceled out the fuel it contained. So be careful to cover all finished surfaces with non-flammable plaster to not run the risk of fire. When molding blocks and bricks of paper, it's a good idea to drain the mix of excess water before placing it in the mold. Just as paper expands when wetted, it also shrinks when it dries, and the more water you can drain off before putting the mix in the mold the squarer the bricks come out when dried. This recipe can be varied as desired...Google papercrete for more info on ingredients. Here's our veteran 8 hp gas powered spike-equipped tumbler that's done us a heck of a lot of good. We toss in dry whole newspaper (unshredded), water, and cement, and the paper gets chewed up by the spikes in the mixer as it gets wet. About 12 minutes to breakdown and mix a batch.